The Huff Model illustrates the probabilities of consumers at each origin location patronizing each store. 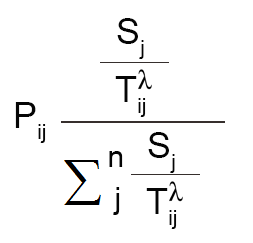 Because according to distance decay, as the distance between two locales increases, the amount of activity between them decreases. In order to help you solve this problem, you can predict the probability of consumer behavior with other competing retail stores with the Huff Gravity Model. Sounds complicated? But it’s actually not so bad. Let’s go step-by-step how to calculate the Huff Gravity Model. 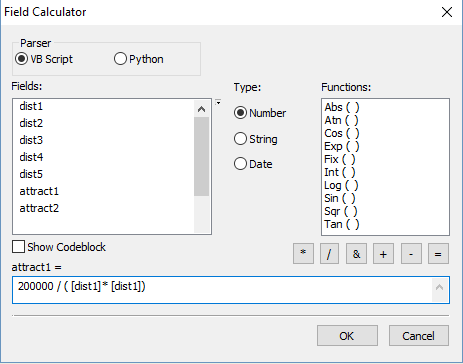 Of course, you will need some GIS software to calculate distance and display the model in a map. 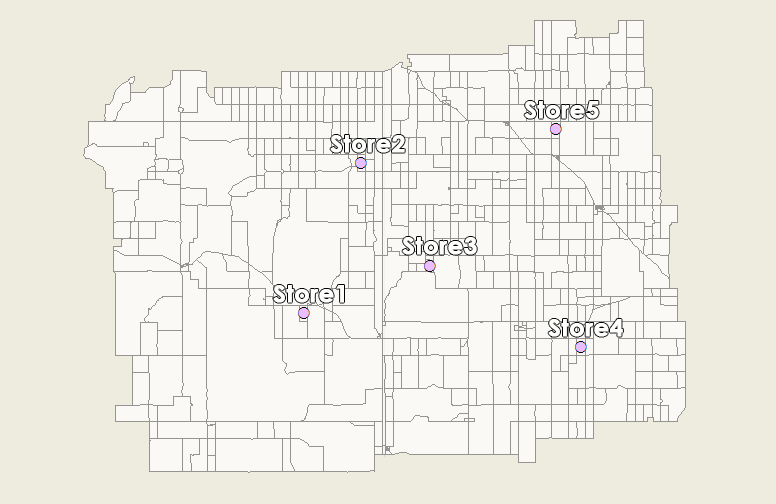 As an illustration, here is where our five retail stores are located with census tracts as the basemap. First, you will take your census data and calculate distance from each census tract to each retail location. In our example, we have 5 retail stores and 738 census tracts. 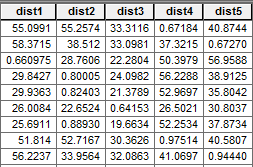 Add 5 fields for distances in the census tract data set (‘dist1’, ‘dist2’, ‘dist3’, ‘dist4’ and ‘dist5’). Calculate the distance for each retail location to each census tract. 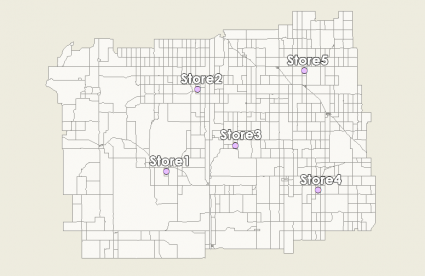 In ArcGIS, you can use the Near Tool and select each retail store individually. In this step, we will incorporate attractiveness for each retail location. To clarify, attractiveness is related to the store size (as in square footage) and inversely proportional to distance. Attractiveness uses distance and the size of retail location. Take the size of the retail store and divide it by the drive-time (or distance square). For example, ‘attract1’ is the square footage of 200,000 for retail store 1 divided by ‘dist12‘. When you plot this on a map, retail store 3 will attract these census tracts the most based on its distance and store size. 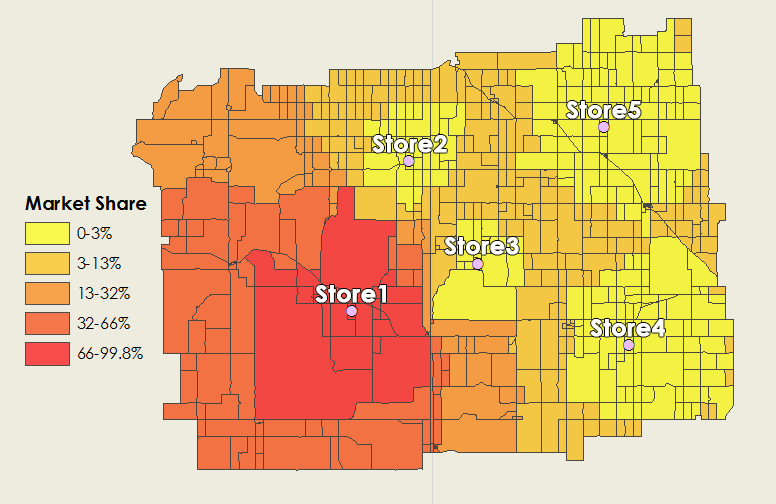 Now that we have each retail store’s attractiveness score, we can start calculating the probabilities where shoppers are most likely to go for each census tract. When close to a retail store, it will capture a large share of the market – hence higher values in the color red. Equally important where other stores are located, it will capture that market share. In particular, the yellow patches indicate there are other retail stores with higher probability of grabbing that share of the market. How about where there are census tracts at distances equal between two retail stores? For these retail stores, the market share is more ‘up for grabs’ and could potentially go to either retail store. In other words, this means that the probability could be at about 50% in these census tracts. As size of a retail store increases, probability increases that a consumer will patron a retail location. Similarly, the likelihood customers will frequent that particular store decreases when distance increases (because it’s in the denominator). 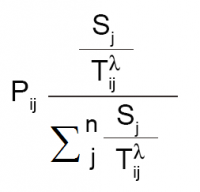 Don’t forget that the sigma notation simply means that you are summing values. As shown above in step 3, all this formula represents is taking the attractiveness score and dividing it with the sum of all retail store’s attractiveness – which should equal 100%. If you are going to invest the time and money to open a store, you should run the Huff Gravity Model. All you need is a bit of GIS data and software to get things started. And let’s not forget incorporating demographics data like United States Census or Esri’s tapestry market segmentation data. As shown today, the two big details you will need are the size of store and distance coupled with census tract population. With these variables, you are on your way to better predict consumer behavior and the probability they will visit your store. 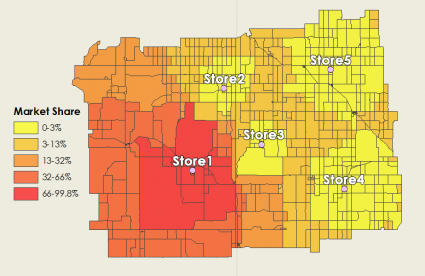 If you want to optimize your store’s location, read more about the location-allocation analysis. Why Is Location-Allocation Optimal For Site Selection? Tech-savvy companies are using the location-allocation tool to find optimal location and target market. Here’s an ArcGIS solution to locate your company. Geodesign is the field of study that combines geography with design. Design shapes our world by addressing the needs of people and promoting more resiliency. Esri’s tapestry segmentation data provides insights on lifestyle choices made by customers helping you make more informative business decisions. First of all, thanks for explaining step by step this process. Would you mind explaining what you mean exactly with “each census tract”?